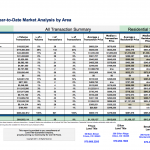 Market Analysis by Area for April 2017: There were 189 transactions and $114,226,938 in monetary volume. 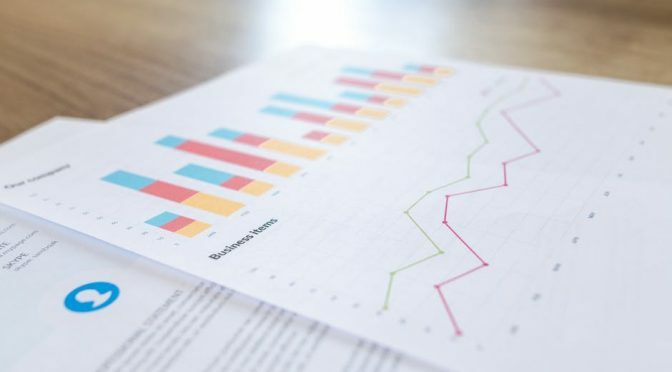 Some trends for all 18 reported areas in April: $618,443- Average transaction price, $651,114- Average residential price and $421-PPSF. Year to Date Market Analysis (4 months): Monetary volume in 2017 totaled $400,422,612 with 621 transactions. 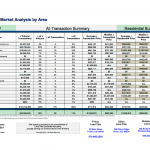 $665,173-Average transaction price, $687,676-Average residential price and $422-PPSF. Market Snapshot for Years 2017 vs 2016: Average Indicators for $: Single Family +22%, Multi- Family +12% and Vacant Land +8%. 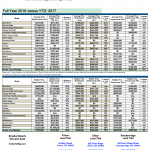 Median Indicators for $: Single Family +30%, Multi- Family +10% and Vacant Land +8%. Market Analysis % Change YTD 2017: Monetary volume ($114,226,938) in April 2017 was 28% higher than April 2016. Transactions (189) were also up at 22% from April 2016. YTD 2017, monetary volume is up by 31% and transactions are up 15% compared to YTD 2016. Residential Market Sales by Price Point: Residential volume in April had 162 transactions with $105,480,438 gross volume. There were 25 properties that sold for $1M and above in April. The most active price point was between $300K-400K with 28 transactions. There were 55 Single Family, 107 Multi-Family and 11 Vacant Land transactions in April. Average Price History by Type 2017: Average price for residential Single Family: $1,141,417, Multi- Family: $458,136 and Vacant Land: $383,469. 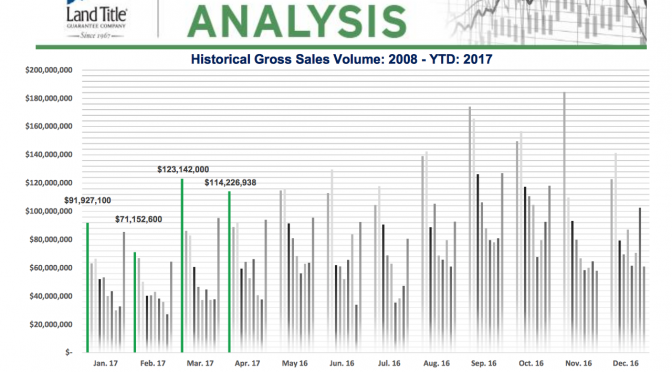 Comparative Historical Cost Analysis 2017 YTD: There were 512 residential transactions and $352,089,998 gross $ volume with 95 properties selling for a $1M and over-compared to 2016, there were 459 transactions and $268,033,677 $ gross volume, 46 properties at $1M and over. In 2015, there were 423 transactions with $232,945,600 $ gross volume, 43 properties at $1M and over. Top Lender Graph: There were 416 loans in April, 64% (189) of the loans were related to sales, there were 110 REFI’s and 185 loans were timeshare related. 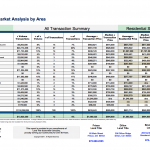 36% of the real estate closings were cash transactions. 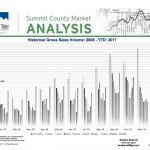 Market Highlights: Please see page 10 of the Market Analysis- You can note the higher priced sale in April in the Highlands/Braddock Hill area, Water House topped out the highest PPSF at $845.76. There were 2 bank sales in April. Foreclosures: There were 5 foreclosure actions in April. 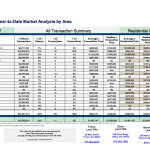 Purchaser Profile Abstract: There were 25 upper end sales in April compared to 38 in March. Our buyers for real estate transactions in April were the Front Range demographic at 45% of our market, 21% are “local” and 34% are out of state buyers with 0% International. Land Title New Development Summary: This (page 16) shows all the new construction each month with 12 in April compared to 20 in March. 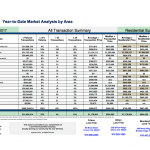 Market Analysis by Area for March 2017: There were 178 transactions and $123,142,000 in monetary volume. Some trends for all 18 reported areas in March: $713,812- Average transaction price, $753,769- Average residential price and $418-PPSF. 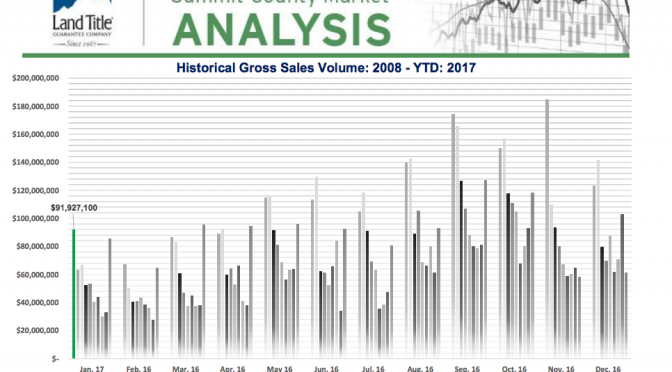 Year to Date Market Analysis (3 months): Monetary volume in 2017 totaled $286,195,674 with 432 transactions. $666,373-Average transaction price, $704,599-Average residential price and $423-PPSF. Market Snapshot for Years 2017 vs 2016: Average Indicators for $: Single Family +30%, Multi- Family +10% and Vacant Land +14%. Median Indicators for $: Single Family +45%, Multi- Family +7% and Vacant Land +16%. Market Analysis % Change YTD 2017: Monetary volume ($123,142,000) in March 2017 was 43% higher than March 2016. Transactions were also up at 31% from March 2016. YTD 2017, monetary volume is up by 32% and transactions are up 12% compared to YTD 2016. Residential Market Sales by Price Point: Residential volume in March had 137 transactions with $103,266,300 gross volume. There were 33 properties that sold for $1M and above in March. 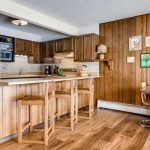 The most active price point was between $300K-400K with 22 transactions. There were 46 Single Family, 91 Multi-Family and 13 Vacant Land transactions in March. 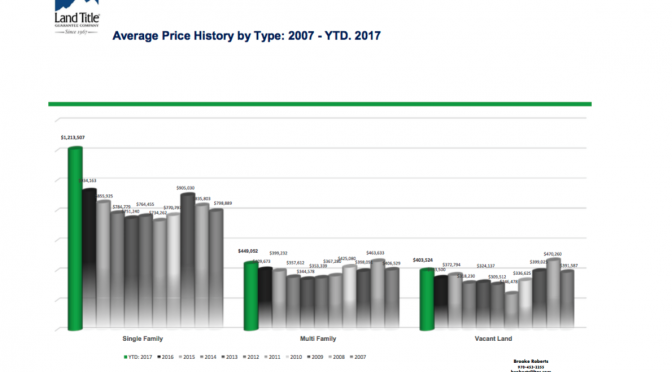 Average Price History by Type 2017: Average price for residential Single Family: $1,213,507, Multi- Family: $449,052 and Vacant Land: $403,524. 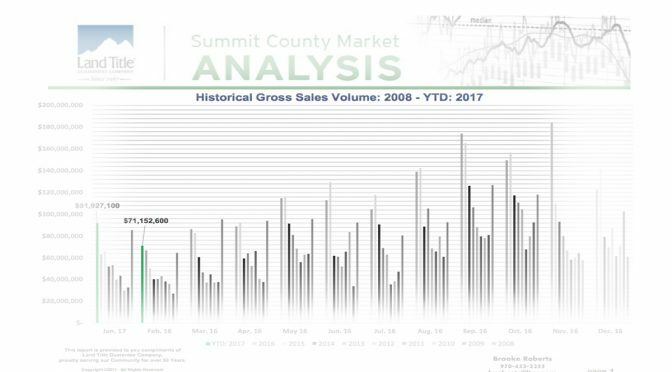 Comparative Historical Cost Analysis 2017 YTD: There were 350 residential transactions and $246,609,560 gross $ volume with 70 properties selling for a $1M and over-compared to 2016, there were 323 transactions and $189,216,250 $ gross volume, 33 properties at $1M and over. In 2015, there were 298 transactions with $159,956,800 $ gross volume, 28 properties at $1M and over. Top Lender Graph: There were 532 loans in March, 63% (113) of the loans were related to sales, there were 133 REFI’s and 286 loans were timeshare related. 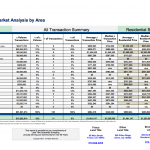 37% of the real estate closings were cash transactions. 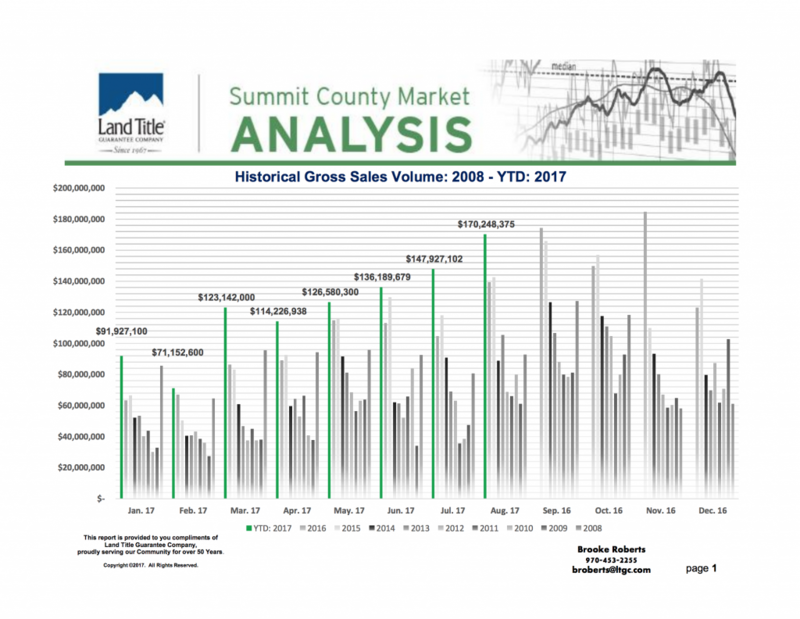 Market Highlights: Please see page 10 of the Market Analysis- You can note the higher priced sale in March in the Sunrise Point area, One Ski Hill place topped out the highest PPSF at $1,327. There were no bank sales in March. Foreclosures: There were 7 Foreclosure actions in March, 4 of those being timeshares. Purchaser Profile Abstract: There were 38 upper end purchasers in March compared to 17 in February. Our buyers for real estate transactions in March were the Front Range demographic at 40% of our market, 29% are “local” and 30% are out of state buyers with barely 1% International. Land Title New Development Summary: This (page 16) shows all the new construction each month with 20 in March compared to12 in February. 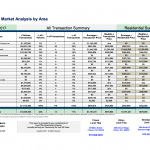 Market Analysis by Area for January 2017: There were 203 transactions and $122,880,919 in monetary volume. Some trends for all 18 reported areas in December: $621,604- Average transaction price, $670,122- Average residential price and $397-PPSF. Market Snapshot for Years 2017 vs 2016: Average Indicators for $: Single Family +22% Multi- Family +10% and Vacant Land -15%. Median Indicators for $: Single Family +16%, Multi- Family 9% and Vacant Land -8%. Market Analysis % Change YTD 2017 : Monetary volume ($91,901,074) in January 2017 was substantially higher at 45% compared to January 2016. Transactions (138) were only up by 11%. Residential Market Sales by Price Point: Residential volume in January had 113 transactions with $79,082,360 gross volume. There were 23 properties that sold for $1M and above in January. The most active price point was up a bit between $300K-400K with 19 transactions. There were 41 Single Family,72 Multi-Family and 7 Vacant Land transactions in January. 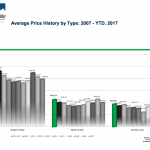 Average Price History by Type 2017: Average price for residential Single Family: $1.139,945 ( another milestone for the highest since Land Title has been tracking), Multi- Family: $449,231 and Vacant Land: $299,714. Comparative Historical Cost Analysis 2017: There were again 113 residential transactions and $79,082,360 gross $ volume with 23 properties selling for a $1M and over-compared to 2016, there were 104 transactions and $55,534,150 $ gross volume, 9 properties at $1M and over and in 2015, there were 98 transactions with $56,210,600 $ gross volume, 12 properties at $1M and over. Top Lender Graph: There were 452 loans in January, 70% (96) of the loans were related to sales, there were 152 REFI’s and 204 loans were timeshare related. 30% of the real estate closings were cash transactions. Market Highlights: Please see page 10 of the Market Analysis- You can note the higher priced sale in January in the Sawmill Patch Placer area, also for the highest PPSF. There were no bank sales in January. Foreclosures: Down again, with only 2 actions in January, compared to 4 in January 2016. There with no PTD filings in January. Purchaser Profile Abstract: There were 25 upper end purchasers in January compared to 22 in December 2016. Our buyers for real estate transactions in January were the Front Range demographic at 33% of our market, 36% are “local” and 31% are out of state buyers with barely 1% International. Land Title New Development Summary: This (page 16) shows all the new construction each month with 11 in January compared to 16 in December 2016. 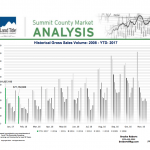 Land Title just published their second quarter statistics for some of the most popular mountain communities. I think one of the things that surprised me most is that in Pitkin and San Miguel where Aspen and Telluride are, over 50% of the buyers are from out of state. This is a very substantial proportion. Both of these areas have their own airports which make the access from other states fairly easy, however, the drive time from Denver is well over 3 hours. 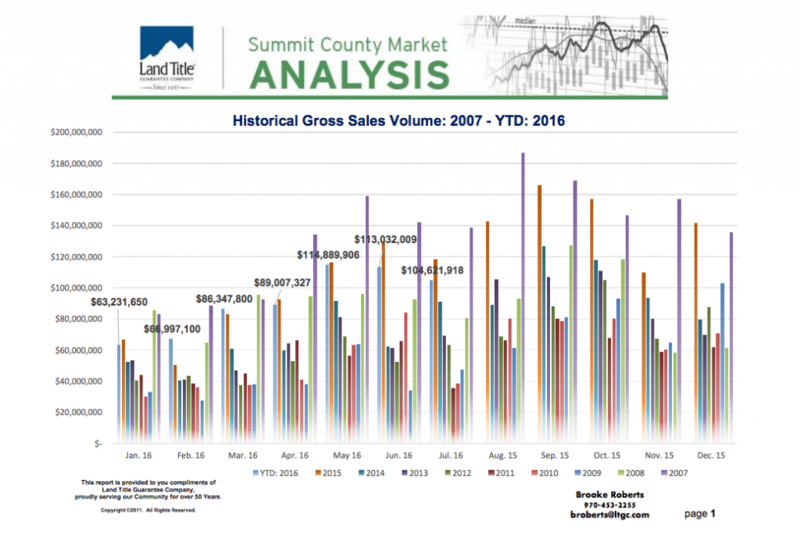 On the other hand, Grand County has the largest portion of Front Range buyers followed by Summit County then Eagle County. It seems that the proportion of Front Range buyers is directly correlated to the distance. When considering a mountain home, your travel time can definitely be a big factor as you don’t want to spend your entire weekend driving.  If you have been thinking about a mountain home, contact me today! Land Title is a local company within Colorado and has been in business since 1967. To help partner with our customers and local communities, we’d like to share some valuable information on the real estate market in seven of our Colorado mountain communities of Aspen (Pitkin County), Breckenridge (Summit County), Steamboat Springs (Routt County), Glenwood Springs (Garfield County), Winter Park (Grand County), and Vail (Eagle County) and Telluride (San Miguel County). 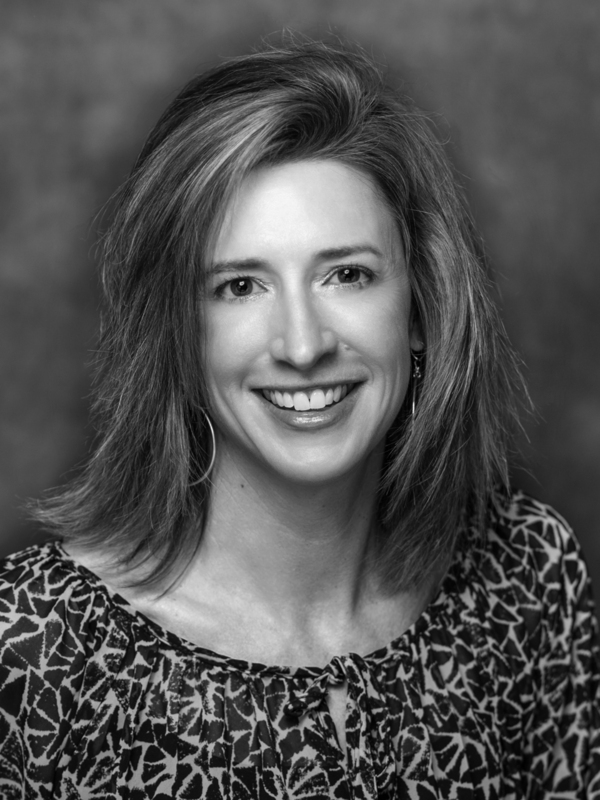 Buyer Profile: 51.49% local, 22.36% Front Range, 25.54% Out-Of-State, .62% international. 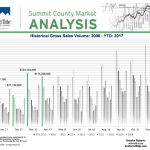 Three counties saw an increase in the number of transactions compared to last year’s Q2 numbers. Grand had the biggest increase with 40.00%. 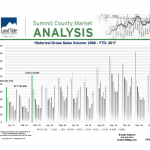 Average residential price up in Garfield, Pitkin and Summit counties. Top county was Garfield with a 10.65% increase.